ROME, May 25, 2016 – They are the key paragraphs of the post-synodal exhortation “Amoris Laetitia.” And they are also the most intentionally ambiguous, as proven by the multiple and contrasting interpretations and practical applications that they immediately received. They are the paragraphs of chapter eight that in point of fact give the go-ahead for communion for the divorced and remarried. That this is where Pope Francis would like to arrive is by now evident to all. And besides, he was already doing it when he was archbishop of Buenos Aires. But now it is being discovered that some key formulations of “Amoris Laetitia” also have an Argentine prehistory, based as they are on a pair of articles from 2005 and 2006 by Víctor Manuel Fernández, already back then and even more today a thinker of reference for Pope Francis and the ghostwriter of his major texts. Further below some passages of “Amoris Laetitia” are compared with selections from those two articles by Fernández. The resemblance between the two is very strong. But first it is helpful to get the broad picture. During those years Fernández was professor of theology at the Universidad Católica Argentina in Buenos Aires. And at that same university in 2004 an international theological conference was held on “Veritatis Splendor,” the encyclical of John Paul II on “certain fundamental truths of Catholic doctrine,” decisively critical of “situational” ethics, the permissive tendency already present among the Jesuits in the 17th century and today more widespread than ever in the Church. So then, that 2004 conference in Buenos Aires, dedicated in particular to the theology of the family, moved in the same direction later examined by Ratzinger. And it was precisely in order to react to that conference that Fernández wrote the two articles cited here, practically in defense of situational ethics. Partly on account of those two articles, the congregation for Catholic education blocked the candidacy of Fernández as rector of the Universidad Católica Argentina, only to have to give in later, in 2009, to then-archbishop of Buenos Aires Jorge Mario Bergoglio, who fought tooth and nail to clear the way for the promotion of his protege. In 2013, just after he was elected pope, Bergoglio even bestowed episcopal ordination upon Fernández, with the title of the extinct metropolitan see of Teurnia. While he confined to the Vatican Apostolic Library the chief culprit of the rejection, Dominican theologian Jean-Louis Bruguès, without making him a cardinal, as instead is the tradition for all the librarians of the Holy Roman Church. And since then Fernández has almost spent more time in Rome than in Buenos Aires, swamped as he is with acting as ghostwriter to his friend the pope, without any growth in the meantime of his credentials as a theologian, already anything but brilliant at the outset. So this is the figure that Francis keeps close as his thinker of reference, the man who put down in writing large parts of “Evangelii Gaudium,” the program of the pontificate, of “Laudato Si’,” the encyclical on the environment, and finally of “Amoris Laetitia,” the post-synodal exhortation on the family. Go here to read the rest. 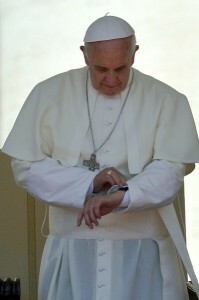 PopeWatch will be blunt and concise. The Church today is being run by loons and worse. God finally did not give us the Pope we needed, but rather the Pope we deserved. The irony —- being named as a prelate of an extinct see—-obviously not seen by either party,… as the Catholic Church lumbers on its way, here and there, to what happened to it in North Africa and in the Middle East.